Not a great photo, but shows a nice slice of the estuary and Port of Oakland with the new Bay Bridge section in the background. What's interesting is the person swimming in the estuary at the lower right...definitely not something you see every day. Being the Oakland history geek that I am, it reminded me of a story from 1903. 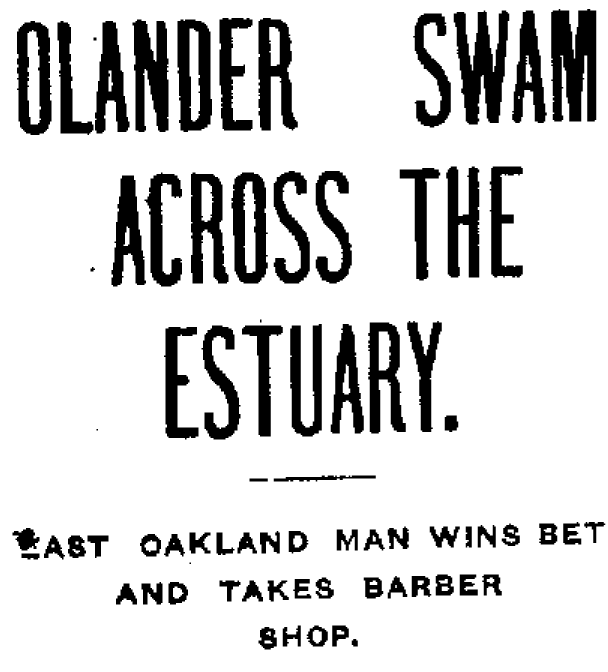 Albert Olander, proprietor of Olander's Saloon in East Oakland, bet his barber that he could swim across the estuary. Olander bet his saloon and his barber, Daniel King, bet his barbershop. 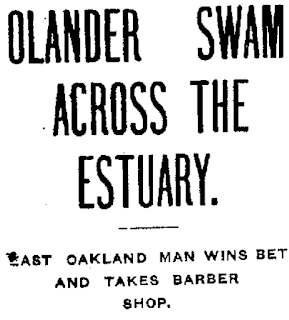 The selected location was about 1.25 miles across, and before a crowd of hundreds of people, Olander successfully swam across and won the barbershop. The building that housed Olander's Saloon is still standing, at 1247 East 12th Street. It's no longer a saloon, but the interior still has the wooden bar and other details from the days when it was. Serious props to the guy in the photo above, who was swimming the length of the estuary, not just across.